Indiana’s perfect season continues, and only the two-time defending national champions stand between them and an invincible season. A 1-0 shutout of North Carolina on Saturday night in Chester earned them a trip to Sunday’s College Cup final. Left back Andrew Gutman scored the game-winning goal on a Trevor Swartz corner in the 50th minute. The real story, though, was the continued excellence of Indiana’s defense. The boys from Bloomington recorded an absurd 18th clean sheet, limiting the second-best scoring offense to eight shots, only two of which were on frame. Center back Grant Lillard was named a MAC Hermann finalist earlier in the day and showed why that was deserved. He once again led a defense operating at a historic level. 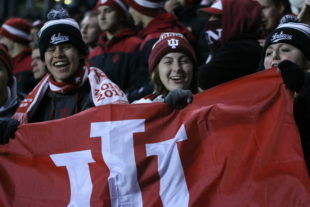 The Hoosiers had to have been fueled by a raucous fan base making the trip to Talen Energy Stadium. If Akron’s fans were loud in the first semifinal, Indiana’s were deafening. The 200 or so supporters sounded closer to 2,000. If you’re a fan of defense and tepid attacking, the first half was for you. The first shot on goal didn’t come until the 36th minute when Indiana midfielder Cory Thomas’ harmless bouncing attempt was scooped up North Carolina goalkeeper James Pyle. Overall, the two sides combined for just five shots, only two of which were on target. That second shot on goal, however, was the first breathtaking moment of the match, coming seconds before the halftime whistle. Indiana worked the ball in the UNC half before a wonderful pass ran into the path of an onrushing Swartz. The Indiana midfielder unleashed an absolute rocket with plenty of movement from 20 yards out with his first touch. As the ball sliced away from Pyle, the goalkeeper left his feet, making an equally incredible save on the wonderful shot. The second half opened up considerably, thanks in large part to an early score. Indiana got the decisive goal from a corner kick in the 50th minute. Swartz delivered the cross from the right corner flag, and his service drifted a few inches over the outstretched arm of a helpless Pyle. Waiting unmarked at the back post was Gutman. The best fullback in the nation and second team All-American tapped in the goal from close range for his 7th goal of the season. The Tar Heels responded with their first shot on goal coming minutes after the opener. First team All-American Cam Lindley, the Chicago Fire academy product, fired a hard shot from the top box after a mazy run. To his disappointment, the attempt was straight at star freshman goalkeeper Trey Muse. It wouldn’t be North Carolina’s last chance of the contest. As UNC poked and prodded the Indiana defense, maintaining possession in the final third, the ball found itself at the feet MAC Hermann semifinalist senior forward Alan Winn in the 72nd minute. With his back to the Indiana goal, Winn made a deft turn from just inside the box and unleashed a low shot that appeared destined for the bottom right corner. Muse objected to this train of thought. He read the shot through congestion in front, got low down, and preserved the shutout. Despite the defensive efforts of the Hoosiers, North Carolina came a few feet from leveling the match in the final minute. Tar Heels No. 10 Zach Wright found down the right side of the box and centered a pass from the touchline. Midfielder Lucas del Rosario made an excellent run and latched on to the ball, but his first-touch poke was just wide. Moments later, North Carolina’s season ended with the referee’s final whistle. Indiana’s victory sets up a dream matchup with Stanford. The Hoosiers are on the brink of the first undefeated season since 1989. The Cardinal are one game away from becoming only the second team to win three consecutive championships. Be sure to catch the College Cup final this Sunday at 1pm. Indiana’s regular-season ties against Maryland, Butler, Michigan, Michigan State kept them from entering the tournament with the No. 1 national ranking. Great coverage Nick. Awesome recaps from both semifinals.